Tracking the Earth's orbit: looking for warming signs | Watts Up With That? The notion that scientists understand how changes in Earth’s orbit affect climate well enough for estimating long-term natural climate trends that underlie any anthropogenic climate change is challenged by findings published this week. The new research was conducted by a team led by Professor Eelco Rohling of the University of Southampton’s School of Ocean and Earth Science hosted at the National Oceanography Centre, Southampton. “Understanding how climate has responded to past change should help reveal how human activities may have affected, or will affect, Earth’s climate. One approach for this is to study past interglacials, the warm periods between glacial periods within an ice age,” said Rohling. The team, which included scientists from the Universities of Tuebingen (Germany) and Bristol, compared the current warm interglacial period with one 400,000 years ago (marine isotope stage 11, or MIS-11). Many aspects of the Earth-Sun orbital configuration during MIS-11 were similar to those of the current interglacial. For this reason, MIS-11 is often considered as a potential analogue for future climate development in the absence of human influence. Previous studies had used the analogy to suggest that the current interglacial should have ended 2-2.5 thousand years ago. So why has it remained so warm? According to the‘anthropogenic hypothesis’, long-term climate impacts of man’s deforestation activities and early methane and carbon dioxide emissions have artificially held us in warm interglacial conditions, which have persisted since the end of the Pleistocene, about 11 400 years ago. To address this issue, the researchers used a new high-resolution record of sea levels, which reflect ice volume. This record, which is continuous through both interglacials, is based on the ‘Red Sea method’ developed by Rohling. Water passes between the Red Sea and the open ocean only through the shallow Strait of Bab-el-Mandab, which narrows as sea levels drop, reducing water exchange. Evaporation within the Red Sea increases its salinity, or saltiness, and changes the relative abundance of stable oxygen isotopes. By analysing oxygen isotope ratios in tiny marine creatures called foraminiferans preserved in sediments that were deposited at the bottom of the Red Sea, the scientists reconstructed past sea levels, which were corroborated by comparison with the fossilised remains of coral reefs. The researchers found that the current interglacial has indeed lasted some 2.0–2.5 millennia longer than predicted by the currently dominant theory for the way in which orbital changes control the ice-age cycles. This theory is based on the intensity of solar radiation reaching the Earth at latitude 65 degrees North on 21 June, the northern hemisphere Summer solstice. But the anomaly vanished when the researchers considered a rival theory, which looks at the amount of solar energy reaching the Earth the same latitude during the summer months. Under this theory, sea levels could remain high for another two thousand years or so, even without greenhouse warming. The study was funded by the United Kingdom’s Natural Environment Council and the German Science Foundation. February 7, 2010 in Climate News, Earth, Science. is he on the official list of Wikipedia approved climate scientists? Fine, if solar radiance is indeed the only influence. But there is another theory, that changes in muon flux alter the Earth’s albedo by altering cloud extent. Muon flux is determined in turn by the cosmic ray flux, of which the local galactic component will vary as the Solar System moves through the spiral arms and up & down through the galaxy disc. There are also streams of cosmic rays within the galaxy whose positions, I understand, are less predictable. Once here, the cosmic ray flux reaching the Earth is controlled mainly by the solar wind (a function of sunspots) and the Earth’s magnetic field. All this is due to be tested this year by the ‘Cloud’ experiments at the Geneva LHC. Or see if one of the approved scientists will okay it. Have been unable to get your link ‘Tips & Notes to WUWT’ to work for reasons I cannot fathom I am using this to point you to another excellent item in the Guardian http://www.guardian.co.uk/technology/2010/feb/05/science-climate-emails-code-release – hope you can use it. The way science should be. Not to nitpick, but “for” is repeated in the title: “…looking for for warming signs”. My take from the article is that we have a broad understanding of the astronomical causes of ice ages, but the details are still unclear. Things are really changing now we see scientific institutions backtracking from the AGW mantra. Not mentioned in the article is that the earth has an elliptical orbit, with an eccentricity of 0.016710219, an Aphelion of 1.0167103335 AU, and a Perihelion of 0.9832898912 AU. This produces a small imbalance between the two hemispheres in terms of solar irradiance reaching the ground, currently in favor of the northern hemisphere (slightly greater average watt /sq. meter). Due to the precession of the equinoxes, with a period of 25,800 years, the imbalance is always in flux, is roughly a sinusoidal function, eventually reaching zero and then changing polarity. I told you guys once already. The author is not on the official Wikipedia list of approved climate scientists I mentioned above. So disregard Rohling’s crap – right now! The Guardian article noted here by Philhippos C cuts right to the core of exactly what is wrong with computer modelling in ‘climate science’. It makes several very important scientific points and seems well worthy of an individual post. Many thanks PC for the link. Why do the eco-wackos want the earth covered in ice? The orbital theory of climate variation has the advantage that we can calculate orbits to almost arbitrary precision in the past, make predictions, and then test them with lots of observational data — assuming that the time precision of the observations is good enough. The other climatic influences are much more difficult to test. Even the impact of CO2 at the present time, where we have a solid grasp of timing of warming versus CO2 change, is difficult to test because the impact is small, despite current hysteria, and mixed with other influences most of which have similar magnitude of effect. Now we have the additional problem of not knowing exactly what the magnitude of temperature is or the true time history. Some climate models are available on line. They are huge and extremely complex, and do not lend themselves to any type of simple analysis of their strengths and weaknesses. Interesting because I believe the interglacial actually began the process of ending at around 0 AD. Since about 0 AD the climate seems to me to be generally cooling at a fairly decent pace. We have had major cool periods, each cooler than the one before with the LIA being probably the coldest period since the Younger Dryas. Each warm period has been a little cooler than the previous. “According to the‘anthropogenic hypothesis’, long-term climate impacts of man’s deforestation activities and early methane and carbon dioxide emissions have artificially held us in warm interglacial conditions, which have persisted since the end of the Pleistocene, about 11 400 years ago. And CO2 cannot save us…..
…But the anomaly vanished when the researchers considered a rival theory, … Under this theory, sea levels could remain high for another two thousand years or so, even without greenhouse warming. So, according to the best research available, either CO2 driven global warming is the only thing holding us back from a plunge into an ice age, or it will be the only thing very shortly (on a geologic time scale) and we are on the cusp (+/- 2k yrs, so we’re in the middle). So we have about 400 years worth of coal to burn up and we need to “get ‘er done” no later than about 1000 years (to avoid momentum into an ice age). Looks to me like we are more or less right on schedule. So, save the Planet, burn coal. Oh! Canada! Burn tar sand oil and oil shales. But with any luck, some of the “climate science” being done will help us figure out how to warm things up a little bit. Buy ourselves a few decades or maybe even a century or two more. It runs close to 30 minutes. What’s really scary is contemplating what the scientists who are coming up with CO2 mitigation strategies were, instead, trying to figure out ways to warm the Earth. Not mentioned in the article is that the earth has an elliptical orbit, with an eccentricity of 0.016710219, an Aphelion of 1.0167103335 AU, and a Perihelion of 0.9832898912 AU. This produces a small imbalance between the two hemispheres in terms of solar irradiance reaching the ground, currently in favor of the northern hemisphere (slightly greater average watt /meter). Due to the precession of the equinoxes, with a period of 25,800 years, the imbalance is always in flux, is roughly a sinusoidal function, eventually reaching zero and then changing polarity. I’m pleased to see more geological imput into climate science these days. Paleoclimatology as a discipline was, before the global warming hysteria, pretty much a secret outside of geological science. Its recent discovery by the new climate science has been the silver bullet that has decimated much of AGW theory of late. There are few geologists that bought into the story that this is the hottest age in earth history, chiefly because of paleoclimatology’s teachings, and there are no geologists who do not know that climate change is the norm rather than the exception. But I see this orbital geometry/sea-level stuff as part of only a piecemeal wearing away of the AGW edifice. With all the very recent new stuff coming out that ravages AGW theory, it is time to examine, not just the folly and fraud, but the anatomy of how this whole thing got started and where we should be going (a good long post on this is warranted). It started with an astronomer musing on how hot Venus is with its atmosphere choked with CO2. Surmising or researching the growth in CO2 on earth, led to this AGW leap of faith without delving more broadly to discover that paleoclimatology had important things to say. Rather, everybody (mostly the wrong people) became climatologists (as late as 2007, MS word underlined the term climatologist in red). An AGW sceptic physicist (source forgotten) some few months ago said something to the effect that: You can’t do climatology without physics but you can do physics without climatology. Although somewhat true, this pretty well sums up the wrong thinking that led to the half baked theory of AGW. Physics is helpful in trying to understand the phenomena but history and geology are more powerful tools in the investigation of natural and anthropogenic climate change (if it indeed is real). Once paleoclimatology (and history) was discovered to exist, all sorts of problems began to arise with AGW. Having entrenched themselves into the AGW faith so deeply, the main occupation became to get rid of the embarassment of the Little Ice Age and the MWP and a number of other WPs. Dendrochronology, and the other tools of paleoclimatology were abused and misused and what started out to be well-meaning but naive scientists finished by being dishonest, destructive anti-scientists. Anyway, lets embrace new studies like the one of this thread, but lets also remake political climatology into scientific climatology. Hark! T’would that be fresh air I smell? Amazing that when the Berlin Wall came down how fast everything changed in Europe. We seem to be experiencing another such event. God has not foresaken us and left us to the mercy of the heathen Warmists. It’s bad because civilization was not supposed to last long enough to figure out how this thing works. Well, almost. Maybe we will, provided certain Dr. Frankensteins don’t hit the Panic Button and launch Operation GCM Bring on the Ice Age. The article above leaves me with a Darned if we do, Darned if we don’t taste in my mouth. Maybe the EPA has it backwards: C02 is not a pollutant, it’s an endangered trace gas. Geologic forces have been overly-sucessful at sequestration. 380ppm, are you kidding me? “I didn’t inhale”. Huybers, P., 2006, “Early Pleistocene glacial cycles and the integrated summer insolation forcing”, Science 313, 508–511. This will probably put me into the “Flat Earth’ers” camp…. I say keeping the ice age at bay is a GOOD THING. Possibly being 2,000 yrs overdue for an ice age beginning is very scary stuff indeed. Worrying about warming when the exact opposite is what we most likely face is a very serious crime being foisted upon us by scientists and the media. I wonder if there are any geoengineering solutions available to counter this. Seriously, this is no laughing matter. This opening points out the essential absurdity of their position. Philhippos C (10:09:33) : …another excellent item in the Guardian http://www.guardian.co.uk/technology/2010/feb/05/science-climate-emails-code-release – hope you can use it. The CRU code is in no way special. On the contrary it is of the average mediocre quality that can be found in most academic institutions. In order to fix such codes and develop a high quality reliable software, non-trivial time-consuming and cumbersome professional commercial engineering work is required. 1. Academic science vs. Commercial engineering. 4. Michael Mann and Phil Jones vs. Steve McIntyre and Anthony Watts. And it’s David vs. Goliath. ago. Clim. Change 61, 261–293. millennia. Quat. Sci. Rev. 24, 1111–1121. Trans. AGU 87 (35), 352–353. responses. Rev. Geophys. 45, RG4001, doi:10.1029/2006RG000207. where should humanity aim? Open Atmos. Sci. J. 2, 217–231. The bottom-line is that the AGW argument for the delay in the onset of the next ice age as calculated by straight application of Milankovitch theory can be dismissed by accepting Huybers’ “Early Pleistocene glacial cycles and the integrated summer insolation forcing” explaination. The fact that the MIS-11 interglacial can be explained by Huybers’ theory with presumably no AGW influences is significant. Call me a simple Mechanical Engineer if you wish, but I fail to see how the Earths orbit can change hugely without a massive increase or reduction of kinetic energy. This could only occur in practice if the Earth was hit by something pretty massive. I accept that gravitational forces of other bodies can change the shape of the orbital ellipse, but this would not produce a global Ice Age. Rather it would mean that the Earth would exhibit more extreme temperatures (ie it would be hotter and colder) within the cycle. And none of this accounts for why Ice Ages turn up almost like clockwork – ie they are too regular to be the result of a chance impact. The only logical answer I have seen for why Ice Ages are so regular was put forward by CERN scientists. They said the frequency coincided precisely with the time it took Earth to travel between the spiral arms in the Milky Way – about 140,000 years. They said was that whilst Earth was in one of the spiral arms, the atomic ray intensity was much, much higher causing a huge increase in cloud seeding. The Earth was blanketed in cloud for thousands of years and temperatures just plummeted. It seemed so logical to me. Especially as the correlation was perfect. It also explains why the ice retreats afterwards and ‘snowball Earth’ doesn’t happen. I saw a presentation online recently but I am dammed if I can find it again. ‘Atomic ray’ should be ‘atomic particles’. Unfortunately the “Rohling metod” that this study is based on is a can of worms. What it measures is not the sea-level as such, but rather the height of the sea level above the threshold in the Bab el Mandeb strait. Unfortunately this area is one of the most tectonically active areas on Earth (it is a “Triple Junction”, i e a place where three continental plates are separating from each other). It is incidentally also right next to the “Afar triangle”, the only place on Earth where a sizable piece of oceanic crust is above sealevel. In this environment the chances of the level of the sill and the profile of the strait remaining unchanged for 400,000 years are very low. Looking at insolation over the whole season has to make more sense than just at solstice. For several reasons. The integration of the orbital elements is non trivial, and not amenable to simple one date analysis. For example, changes in obliquity will interact with changes in the precession of the equinox and changes in eccentricity of orbit. There will be epochs where solstice NH insolation is high, but tails off more rapidly in the shoulder seasons, and epochs where solstice insolation is lower, but stays at highish levels into the shoulder seasons. In a few hundred years we’ll have self-replicating robots on the Moon who can fabricate reflectors and start covering the surface. Aim them at the Earth as needed for the few extra watts to keep the ice at bay. That’s much saner than trying to directly modify the situation down here on the planet. Still groping in the dark. We´re in need of a new cosmological view. However scientists have to live neither hurting common paradigms nor believers or deniers alike, just “roses, roses”, everybody happy…until the next “gate” opens up. Svalgaard: what is the energy in the cosmic ray flux compared to simple day light? Look for a link in the sidebar under “Pages”. That’s easy to answer. It would make humans extinct. The history of the natural climate is and will remain the history of the astronomical orbit and at least E+03 accurately discerned cycles of period E+05 years demonstrate that conclusively, and there is no energy influence to change the Earth’s climate that would not change the Earth’s angular momentum or the topology of the Earth’s orbit in it’s course round the Sun. I find it interesting that a single or primary cause is sought after. There is no reason both theories cannot be effective. In the context of this article, there is also no need for a rival theory, unless one makes the assumption that the galactic arms maintain the same shape and identical spacing over each 400K orbit of the solar system. Another concept of the same ilk has been proffered regarding past climate. The MIS-11 interglacial had CO2 ranging from 4000ppm dropping to current levels over its interval. crosspatch (11:08:43) I agree with your assessment, I noticed the decline in the peaks of previous warm periods since the Holocene. “That’s easy to answer. It would make humans extinct. Excepting for those who could bear the cost of survival. I had a discussion with a Greenpiece advocate who confided that he was aware that the “poor end” would not survive a shift to “green,” progressively fewer able to survive as “carbon” limits were ratcheted down to some 80% of what they are today. Hmmm, so the next Ice Age is overdue by two millenia. And the reason is a mystery. Now what was it that happened approximately 2000 years ago that promised salvation for all humankind? Hmmm, now what could that be? No, geoengineering will not save us from the cold, but prayer just might! Possibly being 2,000 yrs overdue for an ice age beginning is very scary stuff indeed. Translation: You have another 2,000 years before the next ice age. BOULDER—Arctic temperatures in the 1990s reached their warmest level of any decade in at least 2,000 years, new research indicates. The study, which incorporates geologic records and computer simulations, provides new evidence that the Arctic would be cooling if not for greenhouse gas emissions that are overpowering natural climate patterns. This is another hockey stick but up in the icey artic. Like Mann’s 2000 year work so is this one. The article below was based on work from David Archer from the University of Chicago. To take this one step further we have an increasing population in the world predicted to be 9billion by 2050 and decreasing land space due to rising sea levels in the next several centuries. Do we do business as usual or make the changes required to avoid the highest extremes of climate change. So we can rest assured, there is no ice age around the corner. To those with lingering doubts that an ice age might be imminent, turn your eyes towards the northern ice sheets. If they’re growing, then yes, the 10,000 year process of glaciation may have begun. However, currently the Arctic permafrost is degrading, Arctic sea ice is melting and the Greenland ice sheet is losing mass at an accelerating rate. These are hardly good conditions for an imminent ice age. Clearly, climate change is far more complex than the climatologists have portrayed (simple dose-response relationship between carbon dioxide and temperature). I’m very glad that other disciplines including astrophysicists, geologists and others are starting to become active participants in the conversation! Its an interesting question. How much change in the underlying plates would invalidate his work? Nothing “prescriptive” about these, eh?! 0.03 W/m2 compared to 1361 W/m2. About the same as that of starlight on a clear night. In both cases only a fraction of the energies actually reach the lower atmosphere. So it’s not like the milankovich cycles, or whatever method is used to calculate insolation because of the earth’s orbit, have been the main drivers for climate throughout the last billion years—they’ve only been evident for the past 1.6 million or so. I think part of the reason (if not the main reason) is position of the continents–land over the South Pole as well as the rise of Panama and central America which stopped the flow between the Atlantic and Pacific oceans–which affected the oceanic circulation patterns around the globe and thus atmospheric patterns as well. I’ve been looking for newish papers on the orbital fluctuations to see exactly where we are and have found nothing except one paper behind a paywall from 2009. Even the summary available to the public gave little solid info, just a lot of uncertainty and maybe the next glaciation is 10-20000 years away (but doesn’t say if that’s the bottom or the beginning). However, Andy revkin did a piece about the Arctic paper by kaufmann. He quoted Overpeck as saying we may be averting the next Ice Age and that for the next 4000 years the north pole will be farther and farther away from the sun in northern hemisphere summer. Repeat: For the next 4000 years the north pole will be farther and farther away from the sun in northern hemisphere summer. we’re already on our way, folks! That’s the open secret in all of this, isn’t it… the western eco-elite will survive while the rest of mankind pays the price. I expect that many understand and share your burning anger. A lot of my CAGW skepticism is energized by the fact that I am a true believer in the inherent equality of people – I am no better or worse than a child in the Sudan, merely more fortunate. This draconian shift promoted by the eco-left to massively reduce CO2 emissions will ensure that that Sudanese child will never have a better life. Another 2000 years to go. Well, that’s comforting. Fusion power should be just around the corner by then. I saw a presentation online recently but I am damned if I can find it again. Enough of the scare think. Any of you old enough to remember the song that says … ‘Whatever will be, will be …. the future’s not ours to see “… ? Good science, good planning, good skepticism. It’s good to hear GCR’s aren’t going to fry me, but Svensmark’s theory doesn’t rely on large amounts of energy but the particles being the instigators of a chain of reactions which nucleate clouds as I understand it. Have you read “The Chilling Stars” Leif? But better: I have read all his peer-reviewed papers on this subject, have you? As proof, tell me how many there are. If you believe climate comes with no consequences, you might want to check out some information on that. Not following regulations is what put us in the dumpers. There is enough resources on earth for everyone’s needs but there isn’t enough for everyone’s greed. Is that why China just signed a record deal for coal imports from Australia? How anyone can think that inefficient technologies are going to be a “boom” is way beyond me. I can’t really if China will ever choose to eventually slow down and reverse their coal usage. I hope so. The CEO of Petrobras has given a talk that peak oil will be in 2010. That also means that oil prices will spike. Those of us that practice efficeincy with our automobiles won’t be hit as hard. Some renewables are easily competitve with Nuclear now and have 7 hours storage built in now with 16 hours in development later. You might want to cite somewhat better references than the ones you have listed. The Hurricane one is thoroughly debunked, for example. Half the rest are only consequences of futilely trying to cut back CO2 (or from unrelated causes, like the oil running out). Many politicians are choosing to stuff the energy sector, but that is a choice. In any case, the warmistas can list any amount of negative consequences of climate warming and still be wrong. It is quite possible that the positive consequences will be better. If the world warms, then prima facie it will have more inhabitable areas (more than compensating for sea rise, in fact) and more productive agriculture. Perhaps we will have wilder storms to pay for that, but it might be a price worth paying. milankovich cycles coincide “only” for the last 1.6 million years? Having dumped on alarmists for using a few decades to predict processes that should clearly be measured in centuries, I guess I can’t argue the point too much if the previous billion years or so doesn’t match. that said, 1.6 million years that does match still seems significant given that it ocurrs in the time span of most relevance to us (as in right now). It seems to me that we can compare the milankovich cycles to the geologic record, but interference from our solar system passing through a dust cloud (for example) for a few million years might be harder to correlate since something like that would seriously impare energy transfer from the sun to earth, but would be pretty difficult to spot with a telescope ten million years after the fact. The Climate Progress piece you linked to references Solomon et al (2009). The article I linked to, by Prof. Tom V. Segalstad, debunks Solomon. Solomon et al. (2009) have obviously not seriously considered the paper by Segalstad (1998), who addresses the 50% “missing sink” error of the IPCC and shows that the Revelle evasion “buffer” factor is ideologically defined from an assumed model (atmospheric anthropogenic CO2 increase) and an assumed pre-industrial value for the CO2 level, in conflict with the chemical Henry’s Law governing the fast ~1:50 equilibrium partitioning of CO2 between gas (air) and fluid (ocean) at the Earth’s average surface temperature. This CO2 partitioning factor is strongly dependent on temperature because of the temperature-dependent retrograde aqueous solubility of CO2, which facilitates fast degassing of dissolved CO2 from a heated fluid phase (ocean), similar to what we experience from a heated carbonated drink. Consequently, the IPCC’s and Solomon et al.’s (2009) non-realistic carbon cycle modelling and misconception of the way the geochemistry of CO2 works simply defy reality, and would make it impossible for breweries to make the carbonated beer or soda “pop” that many of us enjoy (Segalstad, 1998). So why is the correct estimate of the atmospheric residence time of CO2 so important? The IPCC has constructed an artificial model where they claim that the natural CO2 input/output is in static balance, and that all CO2 additions from anthropogenic carbon combustion being added to the atmospheric pool will stay there almost indefinitely. This means that with an anthropogenic atmospheric CO2 residence time of 50 – 200 years (Houghton, 1990) or near infinite (Solomon et al., 2009), there is still a 50% error (nicknamed the “missing sink”) in the IPCC’s model, because the measured rise in the atmospheric CO2 level is just half of that expected from the amount of anthropogenic CO2 supplied to the atmosphere; and carbon isotope measurements invalidate the IPCC’s model (Segalstad, 1992; Segalstad, 1998). Leif Svalgaard (16:08:11) :…energy in the cosmic ray flux compared to simple day light? 0.03 W/m2 compared to 1361 W/m2. Then I vote for natural oscillations instead. Is it so difficult to understand that a system can have substantial oscillations that cover a wide range of timescales even if the external force is constant or nearly constant? Ever heard about reaction-diffusion systems? “Natural oscillations,” of sorts. How much more does the sun need to slow down and weaken its magnetic interlock amongst other forces before Earth’s orbit starts slipping? Why do solar cycles slow down, lengthen and then go thru periods where they speed up? ..”external force is constant or nearly constant?,” nope. This assessment, like the others you posted, just doesn’t stand up to scrutiny. The green economy is going to accelerate the already begun process of cleaning our clocks. Kyoto was a tremendous boon to China. Factories in Europe and North America closed and new, dirtier factories opened in China and other parts of Asia to replace them. You just can’t make the cost of doing business more expensive and expect the overall economy to improve. Increasing the cost of energy make us less productive and less competitive, not more. “Carbon” emissions and other greenhouse gases simply are not a problem. There is no climate crisis and the earth is in no more or less peril than it’s been for millions of years. We should all focus our limited time, energy and money on solving real problems. Leif Svalgaard (16:08:11) : 0.03 W/m² compared to 1361 W/m². Carla (05:17:57) : “external force is constant or nearly constant?,” nope. What would be the magnitude of the external variation in terms of W/m²? There is the 1.3 W/m2 variation of TSI. Any other external variation is of the order of a million times less. Now, imagine you have 10 million external variations all working in the same direction, then you have something. Don’t misunderestimate fools’ capacity for conjuring up something like this. Is there any way to set things up that we can send a message directly to someone who has made an earlier Comment? I am thinking of a behind-the-scenes system that does not require revealing the e-dress of the original commenter. I fear that many comments on comments are never seen by the original writer because of the need for original commenter to come back later to a topic and look for additional comments. A case in point is that I wanted to send an encouraging comment on the comment by Douglas DC (14:31:28): “…..as one who wouldn’t pass an Aryan test…..a white greenie’s biggest fear is healthy, happy_prosperous_ dark skinned people”. I just wanted to point out that Hitler was misinformed. “Aryan” is from the same origin as “Iran”, whose people are not quite as light skinned as the average western European (as is also true of real “Caucasian” people from the Caucasus region). Great discussion of the various theories of how and when ice ages end. Certainly the literature such as the 1992 Devil’s Hole paper (Science), deep sea cores and the Vostoc cores suggest that the last interglacial ended before the rise in summer insolation, a “problem of causality”. I would like to throw into the pot another study outside the usual realm of climate science. The Book “Homo Britannicus” by Chris Stringer is a detailed compilation of multidisplinary scientific studies of the climate and life of the British Isles during the Ice Ages. The study found that the interglacial 400,000 years ago lasted 40,000 years in Britain with a significant cool spell midway. Since the Milankovich signal is now about what it was 400,000 years ago, how can we say that the next ice age is overdue by 2000 years in light of what was observed in Britain. Certainly researchers like Imbrie and Shackleton have shown correlation with the Ice Ages but as we all know, correlation is not causation and it appears that the driver of ice ages is much more complex than simple high latitude insolation and its CO2 and albedo feedbacks. 1) Laskar, J.; Robutel, P.; Joutel, F.; Gastineau, M.; Correia, A.C.M. ; & Levrard, B. (2004). A long term numerical solution for the insolation quantities of the Earth. Astronomy & Astrophysics 428, 261-285. 2) Huybers, P. (2006). Early Pleistocene glacial cycles and the integrated summer insolation forcing. Science 313, 508-511. Stine, A.R; Huybers, P.; & Fung, I.Y. (2009). Changes in the phase of the annual cycle of surface temperature. Nature 457, 435-441. doi:10.1038/nature07675. Thompson, D.J. (2009). Shifts in season. Nature 457, 391-392. The last one is a bit inflammatory, hitting on points that are both resonant & dissonant with opinions regularly expressed around here. He conveys the impression that he has no awareness of EOP (Earth orientation parameter) variations on decadal timescales. Leif Svalgaard (08:46:43) : There is the 1.3 W/m2 variation of TSI. I wonder exactly when energy considerations became passé? Perhaps the skill to judge what is large and what is small is not a popular topic in school anymore? We all know that most journalists have no idea of scale when they write about millions of tons of CO2, but judging what is a proper comparison should be elementary wisdom for scientists and engineers. He conveys the impression that he has no awareness of EOP (Earth orientation parameter) variations on decadal timescales. I’m reasonably sure that he knows that the atmosphere and the oceans and their movements [changes of moment of inertia are the [almost sole] causes of changes in EOP. I wonder exactly when energy considerations became passé? People pushing agendas ignore energy considerations. Even the 1.3 W/m2 TSI variation is sort of meaningless compared to the 90 W/m2 variation through the year [largest in January]. Right! So we have a variation 1361 W/m² between day and night and a variation of 90 W/m² between summer and winter. Surely it is no exaggeration to state that the external (oscillatory) force is constant or nearly constant. 0.1 mm/year either up or down would suffice to invalidate the results. If the Milankovich curve isn’t a principal driver of ice-ages it seems very unlikely that the two dominant cyclicities (41 kyr, 100 kyr) would just happen to coincide with the obliquity and eccentricity cycles. In any case the Milankovich cycles are clearly visible in high-quality sedimentary records through much of the Earths history, even in extreme hothouse climate periods. However I agree that other factors also have influence, for example nobody has yet found a completely satisfactory explanation why glaciations switched from 41 kyr to 100 kyr cycles about 800 kyr ago. What do you think of his other work? a variation of 90 W/m² between summer and winter. Somehow, I don’t think that Somerville understands as much about how orbital mechanics triggers ice ages as he thinks he does. But why is 0.2 W/m2 for 200 years meaningless, if that’s the difference from the preceeding 200 years? What would that do to OHC and ice cover? You don’t know because you don’t know how much of that is stored in the ocean. Aren’t you pushing the power argument and ignoring the energy considerations. All astronomical causes are strictly periodic [on time scale of centuries] and don’t matter because there are no strictly periodic terms in our climate of the sharpness and magnitude required to stand out above the noise. If not above the noise [so sophisticated statistics is needed to flush them out], then the effects are not important. I have not looked at his other work. The day only has 36 hours. OK. Even more convincing then. But why is 0.2 W/m2 for 200 years meaningless, if that’s the difference from the preceding 200 years? We worry about what we have evidence [or good theory] about. And I have not seen any that qualify as good. People even claim that the temperatures the past century are unreliable. Also, there is a balance between what goes in and what goes out. As long as we don’t know what the delay is [if any], then we cannot conclude anything. There are some reasons to believe that the delay is short. People talks about 7 years, or 3 months, or something of that order. Something tells me that it short, e.g. we get 90 W/m2 more during January [scaled by varies factors: 4 and albedo] than during July. Are you telling me that that the 45 W/m2 we get above average is stored, but the 45 W/m2 we get the rest of the time is not? What difference is there between an extra Watt we get from solar activity from an extra Watt we get due to the orbit not being circular? Let me elaborate a bit more on the storage issue. Some people claim that the Watts from solar activity cycles are stored [e.g. in the oceans] and a string of high cycles will cause more heat to be stored as they [so it is claimed] add on top of each other. Then, by the same argument, the extra 90 W/m2 we get every January is stored, and every new January adds another 90 W/m2 to the store. This goes on for millions of years…. So, if those January Watts are not really stored, then how the system know only to store a solar activity Watt. Also, I’m always amazed at the people that claim long-term storage not objecting to the thousands of papers that claim that there is solar cycle correlation with nary any delay [and vice versa]. Although I disagree with your assessment (in part because I like a puzzle more complicated than a 1+1=2 wiggle-matching exercise), I’m content with disagreement. He is making some fairly lofty claims about solar effects on the Earth. If he is not coming under aggressive attack for his views, this may be informative. After reading Climategate: The CRUtape Letters I think it is pretty obvious that we cannot be certain that we did not have a MWP and a LIA. Thus, the first place to start would be to ask: what caused the MWP and what caused the LIA? What is your theory Leif? My own speculation at the moment is that we may have reaction diffusion type ocean cycles that last several hundred years. Sometimes it can be relaxing to watch Rayleigh-Bénard convection and wonder whether similar patterns can cause a MWP and a LIA? In Rayleigh-Bénard convection the external force is completely constant. Puzzle away then :-). As long as you it’s just a puzzle, everything is fine. Hundreds of people over hundreds of years have made such claims. One cannot expend energy to aggressively attack yet another one. What is your theory Leif? I don’t think I need to have one to resolve the AGW issue. Solar and stellar activity are confined to stars with a deep convection zone and thus prone to oscillations and that without any external influences needed. The cooler a star is, the greater is it’s activity, so one could hardly blame that on some planetary external influences [this is for die-hard astrologers]. If there are small random wobbles [and convection is just that] it is easy to get situations where the wobbles will interact and sometimes stochastically add up to larger fluctuations. Even on the Sun we see this, where in addition to the fine-scales granulation there are complexes of such cells forming a larger scale super-granulation, extending to somewhat greater depth. Most studies of convection in the laboratory have been about very shallow layers [because they are easier to study], but in stars we have a continuum of cell sizes from very small all the way up to a significant fraction of the radius, and that in a spherical shell to boot, so hard to study experimentally. I used an analogy with the Sun, rather than directly addressing your point, because I’m more comfortable with that, and because the widely different stars show us a wider range of phenomena than just our own planet’s. OK. Thanks. I am not certain whether we fully understand convection in the oceans either, in particular since we do not (and never will) have sufficient computational power to calculate convection with the required precision for the huge oceans. China is making solar cells and windmills for you to buy, Jeff, because the Chinese know they have a greenie weenie market for them, and they know they can beat the price of green stuff made in the West because of the cost of manufacturing is too high (if regulations will permit any manufacturing at all). The US isn’t going to sell solar cells or wind mills to China, Jeff. Who are you going to believe about “climate change,” Jeff – the geologic history of the Earth or Al Gore? What is the basis of your decision of who or what to believe? we do not (and never will) have sufficient computational power to calculate convection with the required precision for the huge oceans. The two systems aren’t really comparable, Leif – mainly because of the pressure gradients, which are basically radially symmetric in the Sun and arise from radiation and gravity; the pressure gradients in the oceans are of a number of different origins and it is their interactions that become terribly difficult to model. Could be quite difficult to tune this model without any reliable measurements inside the sun. SDO [Solar Dynamics Observatory – launching Wednesday]] will give us a lot better data than what we already have from GONG and SOHO [and those are already quite good]. There are some differences, but there are magnetic fields inside the Sun that made the pressure tensor vary with direction and time [no real symmetries here], so although different, much the same equations [even more difficult for the Sun because of the magnetic field] apply. Jupiter is another case that we’ll be able to tackle decades from now, presenting us with yet other complications. But er learn from all those differences. I might have been one of those people your cite that think you can ‘store’ heat in the ocean. Many people are just trying to get all of the aspects of climate science into focus. Of coarse you cannot store heat, anywhere and never. But the term might be used to speak of the difference in heat between a system at a deemed normal 68 defF and the energy in the oceans after the normal has risen to 69 defF. Some might term that storage. I might have done that also. Wish you could read between the lines. Actually I think I was talking of that ‘storage’ as the temperature had risen slowly over some period. Sorry for not being exact in my words. I see your point, it’s instantaneous. But in that case the change was happening year after year after year per the trend line which brings into mind the word storage for visualization purposes. But even still, that field remains divergence free! I might have been one of those people your cite that think you can ’store’ heat in the ocean. I’m perfectly happy with the notion of storing heat [or heat content, OHC]. Some misguided ‘purists’ want to obscure the issue by saying that ‘heat’ is ‘energy in transit’ and therefore cannot be stored. IMHO that is nitpicking. Part of the confusion comes from the English language where the verb ‘to heat’ is conflated with the noun ‘heat’. The process ‘energy in transfer’ is better translated as ‘heating’ or even ‘warming’. That removes the problem. Most other languages don’t have that problem. The change can only happen if you can ‘hide’ the ‘old’ heat somehow in the interior year after years after year, and that does not happen in a fluid medium because warmer water [above 4C] is buoyant and will rise to the surface [cold water sinks, warm water rises]. You want warm water to sink in order to store its heat. No, because the field acts a seed for generation of more field by a dynamo process through the induction equation. That’s why this is so hard to compute. Carbon dioxide has a variable atmospheric lifetime, and cannot be specified precisely. Recent work indicates that recovery from a large input of atmospheric CO2 from burning fossil fuels will result in an effective lifetime of tens of thousands of years. The mean lifetime of anthropogenic CO2 is dominated by the long tail, resulting in a range of 30–35 kyr. The long lifetime of fossil fuel carbon release implies that the anthropogenic climate perturbation may have time to interact with ice sheets, methane clathrate deposits, and glacial/interglacial climate dynamics. Simulations of deep ocean CO2 injection as an alternative to atmospheric release show greater chemical impact on the deep ocean as the price for having less impact on the surface ocean and climate. Changes in ocean chemistry of the magnitude shown are likely to be biologically significant. Possibly you found climatology that agrees with your world view. This is an interglacial that can give us information on what will be a high provbability that will happen to us. 23 to 26 feet sea level rise. This may take several hundred years. If co2 has the long residency time that many scientists say that it has this will then happen. Carbon free energy is the way of the future. Why not do all we can at home. I have met people here that live off grid. Would you rather buy American if you can? I’m confused, Leif. Doesn’t the non-divergence of B imply the existence of magnetic monopoles? Imagine you have a coil without current. There is no magnetic field through it. Now, switch on a current in the coil: a magnetic field appears threading the coil. No monopoles needed. We have a co2 spike unparrelled in geologic time. Our way of life we have now depends on a narrow level of GHG’s. There is uncertainty of what will really happen and yet it is more than clear geologically that we will warm and change in climate. By economic analysis that I have read, adaptation will cost aprox 20% of world wide GDP and mitigation starting today is less than 1% GDP. Nuclear is having a tough time right now. There are tritium leaks at 27 of the 104 nuclear power reactors. The 40 year life cycle just might be holding true. That is an extremely small value. Could you tell me why such a small value would disqualify the work? Here is a list of peer reviewed positives and negatives of the coming warming climate. It is not possible for [innumerable] people to survive without “carbon energy” in this society, Jeff and I unfortunately lack the capability to convince you of that. Really? I’m being told that CO2 retaining 3.7 watts/m2 world wide is a freakin disaster. So I’ll replace my natural gas furnace and my gasoline engine in my truck with solar thermal electric. To stay well under that disaster 3.7 watts/m2 I will limit my aborption of solar energy over normal earth absorption to say 1/2 watt/m2. How many square meters of space will I need to capture an amount of solar energy that is safe for the planet and will replace my 100,000 BTU furnace and my 250 horsepower truck? My understanding is that the earth’s magnetic field is also generated by convection currents but in the earth’s molten outer core. From time to time the earth’s magnetic field reverses polarity. Most likely the various convection cells pretty much cancel each other out, leaving behind a very weak magnetic field that can easily be reversed by a slight change in strength of one of the cells (by easily I mean over a geologic time period, we know the reversal takes about 5000 years for a full transition). But this does raise a new question (for me anyway) that I don’t think I have seen discussed. Has there been any work done comparing earth’s magnetic field orientation to ice ages and milankovich cycles? Has there been any work done comparing earth’s magnetic field orientation to ice ages and milankovich cycles? The last reversal, the Brunhes-Matuyama reversal, is thought to have occurred some 780,000 years ago. Many Milankovich cycles have rolled by during this long interval, so there does not seem to be any connection. ^ edited by Susan Solomon … (2007). “Frequently Asked Question 7.1 “Are the Increases in Atmospheric Carbon Dioxide and Other Greenhouse Gases During the Industrial Era Caused by Human Activities?””. in Solomon, Susan; Qin, Dahe; Manning, Martin et al.. IPCC, 2007: Climate Change 2007: The Physical Science Basis. Contribution of Working Group I to the Fourth Assessment Report of the Intergovernmental Panel on Climate Change. Cambridge, United Kingdom and New York, NY, USA: Cambridge Press. ISBN 978-0521-88009-1. Retrieved 2007-07-24. Then you throw up a red herring about “recovery from a large input of atmospheric CO2.” The first reference (53) concerns modeling about the hypothetical injection of vast amounts of CO2 into the oceans. Thus tries to pass off the results of a model as evidence of something in the real world. The other reference (54) does the same, in a paper largely considering “ocean acidification.” In both cases there are considerable variables and processes that are necessarily left out for modeling purposes. So against real-world measurements, your “rebuttal” is someone who stated a figure also saying no one can know the figure for certain, and computer models showing hypothetical amounts of CO2 being pumped directly into the ocean. Such a convincing rebuttal. Not. The effect is supposed to work through the mediation of Cosmic Rays. The solar wind at times screens us from the cosmic rays when a big solar storm is in progress leading to a significant decrease in cosmic rays, called a Forbush Decrease (FD) [after Scott Forbush who discovered this phenomenon]. If you through a softball against a big brass bell, you might get a weak ‘ping’ as response. An FD is like hitting the bell with a sledgehammer: you would expect as loud and overwhelming response. A recent paper in GRL http://www.leif.org/EOS/2009GL041327.pdf examines the effect of the five largest sledgehammer blows [FDs] during 1989–2001 on global cloud cover and finds to response at all. A recent paper in GRL http://www.leif.org/EOS/2009GL041327.pdf examines the effect of the five largest sledgehammer blows [FDs] during 1989–2001 on global cloud cover and finds NO response at all. Solar winds are [mostly] protons of a modest k.e..; and when the k.e. of these winds exceeds exceeds a certain magnitude related to soundspeed in the ionosphere the winds can cause a (visible) bow shock at the boundary of the Earth’s magnetosphere (which does interact with the Sun’s), and that shock (the rarefication and expansion of mesosphere plasma) could influence cloud formation (which has been documented). Some of the 90 W is stored too. The OHC isn’t constant over the year, as you know of course (and you showed a graph long ago I think). There are several delays. One very short, weeks/months(?) to distribute the heat through the well mixed layer, but the delay for all of the ocean is much longer, around 800 years I would think judging from the temp-co2 lag in the ice cores. And an even longer delay, thousands of years probably, to adjust the snow and ice cover. Some of the 90 W is stored too. Not my point, which is that people want all of the 1.3 W/m2 stored, so unless ALL of the 90 W/m2 is also stored, how does the Sun know to store ALL photons from the 1.3 and only some from the 90? This makes sense. I am no expert here, but my gut feeling is that the oceans with an average depth of ~4000 meters and a resulting huge thermal mass may have many characteristic time constants covering a wide range of time scales. Leif Svalgaard has a brilliant argument that the large planets in our solar system have negligible impact on the behaviour of the sun – the force from Jupiter on a sun molecule is vanishingly small compared to the force from the sun itself. Similarly, however, one could argue that a water molecule at, let’s say, 700 metres depth, may be only marginally influenced by the “rapid” surface temperature fluctuations. In a fluid with good mixing the energy redistribution would be nearly immediate; however, the oceans are so huge that I suspect that the thermal transients may cover a wide range of amplitudes and time scales. The dominant time constant may very well be 3 months; still other transients may exist with dominant time constants in the order of decades, centuries and millennia. Sure, below 1000 metres the temperature approach 4 ºC, but the ocean heat content may still be subject to substantial oscillations, see this curve by Loehle. Hello. I’m german. We’re doing mitigation. Your 1% number could be about right. What can i say? Unemployment rises, wages drop, standard of living goes down, electricity prices rise with 6% a year. But we’re all very glad that we have so many wind turbines. We’ll last for a few more years. That Kopp paper on interglacial sea-levels is a piece of junk science. They use coastlines that have been glaciated for their estimate (e. g. Bröggerhalvöya and Jameson land). Those coasts have been depressed several hundred meters by the ice and rebounded since the last glaciation. There is no way you can use the present level of those coastlines to estimate Eemian sealevels. They try to hide the bad data by a lot of fancy bayesian statistics, but no amount of statistical juggling can create data out of random numbers. The other cited papers are junk too. As a matter of fact it was one of them that originally got me interested the AGW controversy. I just couldn’t understan how such garbage could be published in Nature, so I started digging into things. It is actually extremely difficult to determine the sealevel during the last interglacial, but the most likely figure, based on the most tectonically stable areas in the World (like the Gawler Craton and the Cooroong coastal plain) is about 6-10 feet higher than today. MIS 11 (the 4th interglaciaial back, that we are talking about) was about 400,000 years ago. 400,000 x 0.1 mm = 40 meters. The Bab el Mandeb sill is 137 meters below sea level so + or -40 meters means that it would have been either 97 or 177 meters deep 400,000 years ago, which equals to about a factor 3 difference in flow. So actually 0.05 mm/yr would be enough to invalidate the results. We have 11 power reactors in Sweden, the oldest 38 years old. They have been well maintained, and have no major problems. The two oldest have recently been upgraded and now produce 20% more power than when they were new. Read through it, seems reasonably conclusive. As I read it, your other response about lack of any obvious climate spikes during periods of earth magnetic pole reversal also sprang to mind. Seems to me that since the time period with no magnetic field at all is about 5000 years during which “shields down” would be a good descriptor, that time period would be more like an artillary batallion with rapid fire howitzers aimed at the bell than a sledgehammer. One would think any effect on cloud formation would correlate to some clear and obvious spikes in the geological record. How does the Sun know to react to the 1.3, but no much to the 90? If 10% of the 90 is stored, then 10% of the 1.3 would also be, yet people claim that 100% is. Doesn’t it? (the earth you mean). The ocean surface temp doesn’t change much in the tropics. It does at high latitudes which of course is more caused by the tilt, so isn’t most of the 90 W stored? or actually the 45 above average, which is released again during the second half of the cycle. Same with a possible 400 year cycle. If we are at max now, most of the 1.3 (or 0.7) is stored and if the 1.3 disappears again for 200 years the accumulated 1.3 will be released. “or actually the 45 above average, which is released again during the second half of the cycle. What you lack is explaining how the Sun knows this. That said, a 0.1% change in TSI still only means 0.07K change in temperature, and even if doubled cannot even be measured. Yes it does. The 1.3 gives the well mixed layer a higher average temp year after year after year, the 45 does not. With your logic the TSI could increase hundreds of watts without affecting the deeper ocean. I am missing why I have to explain how the Sun knows this. Who said the Sun needs to know anything? 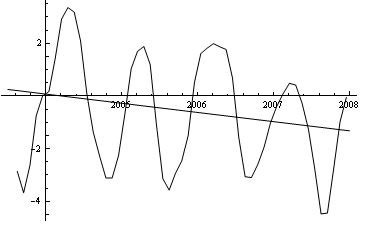 Assume for illustration that the solar cycle was a perfect sine-curve with a 1.3 W/m2 variation. You maintain then that in every cycle heat is added [year after year after year] and that the OHC would increase indefinitely. I say that there will be no change whatsoever in the long run. The 1.3 gives the well mixed layer a higher average temp year after year after year. Doubling? is the scale F, C, or K? The temperature has steadily fallen the past several thousand years as we are moving away from the Milankovic optimum. I guess you have lost me. Doubling of the rise since the glacial, around 5 C.
In a couple of millennia if the trend after 1700 continues. The temperature has been falling for thousands of years. So what, it’s been rising the last 300 years, and if the trend for Armagh were global it would rise 5 C the coming 1000 years, a hugh increase. solar activity has not risen the last three hundred years, and that was the issue. So the solar activity 1600-1700 was the same as 1900-2000 ? You know it’s pointless to compare the year 1710 with the year 2010. It is pointless to compare any single year with any other single year. Solar activity has not increased the last 300 years. People keep citing old, obsolete papers. The past 10 years or so have seen many studies including our own that show that the myth of steadily increasing solar activity the past 300 years is just that: a myth. “they do not indicate unusually high recent solar activity compared to the last 600 years”. Again, we were not discussing back to 1400 AD, and even if true, all the data shows unusually low activity the decades around 1700. You did. You see a steady trend in temperature over 300 years and claim it is due to a similar steady trend in solar activity. But all the curves you have linked to is showing a positive trend since 1700. That’s unfair. I never said “steady trend”, but the long term trend since 1700 is up, in both solar activity and temp, CET and most NH temp reconstruction. (1700 is a logical place to start since that’s the minimum in the temp reconstructions) So all we need is an amplifier for the TSI increase. I’m starting to doubt the idea of using the S-B law and global average values. If TSI increased 0.5 W since 1700 that would mean close to 0.5 W increase at low latitudes where most of the input is. If most of this is then absorbed and much of it transported to higher latitudes, then the simple S-B calculation will be wrong for determining the effect on global temp change. TSI ‘may’ have increased by 0.5 W between 1700 and ~1780, then decreased 0.5 to ~1810, then increased 0.5 to ~1870, then decreased 0.3 to ~1900, then increased 0.5 to ~1990, then decreased 0.3 to ~2010, and so on. Their Figure 1d is telling. There were a dip in 1700 [although it is not certain what caused that [considering that the Sun was coming out the Maunder minimum – perhaps volcanic activity is partly to blame]]. TSI 1725-1800 was not any different from 1950-2010. Even the Steinhilber graph is disputed for some years, e.g. around 1900. My point is that the EVIDENCE for the myth is weak, if there at all. And even a 0.5 W/m2 change is still 0.04%, corresponding to 0.01% in dT or 0.03K. With a 10x amplifier [much too big, but giving you the benefit of a wild assumption], we are talking about 0.3K, which is not measurable in the data. One of the better reconstructions is by Steinhilber et al. http://www.leif.org/EOS/2009GL040142.pdf Even the Steinhilber graph is disputed for some years, e.g. around 1900. Br varies cyclically between a ceiling and a floor over that time. The trend line in the middle is flat. Its R^2 is 0.0019 [=no trend]. And my point is that it’s a myth that 0.5 W/m2 (TSI) is insignificant. What is the TSI/4 ? if TSI/4 = 0.3 W/m2, then TSI = 4*0.3 = 1.2 W/m2. Perhaps you mean dTSI? but TSI has not increased 1.2 W/m2 since the mid-1950s… Explain. You can make the number look even more impressive by converting it to ergs: 2×10^30 ergs. Ok, a clumsy way to show that the 0.5 is the dTSI but 0.3 is for the earth surface, which is dTSI/4. Isn’t it? It is best to omit all those factors [1/4 for conversion from disk to sphere, 0.33 for albedo] and simply report in terms of [raw] TSI or better in %. If you want input to the surface then it is TSI[raw from sun]/4*0.33 = TSI/12. So the 0.5 W/m2 [beats me where you get that one from, but let it pass], is 0.04 W/m2 at the surface. My bad with the albedo correction. So you are saying that the heat content since 1955 comes all the way back from 1700? Solar activity 1725-1800 was higher than 1950-2000, so, indeed I don’t see the stuff coming from 1700. But, AHA: you are claiming that the high solar activity 1725-1800 is the direct cause of the global warming since 1970: 1.7×10^23 J increase in OHC. I see now. Sorry that I was so thick. I see now. Sorry that I was so thick. I had misunderstood you all along. I see now that you believe and argue for long-term storage and thermal inertia so that all that [extra] heat from 1700 to 1725-1800 was quickly hidden away, to only surface now to fool some people into believing that the recent solar activity has anything to do with our climate. Silly me, that I could fall for that. No, but it’s still increasing because it was much lower in 1700 and 300 years is not long enough to reach equilibrium. There is no evidence that it was ‘much lower’ in 1700 and in any case only briefly. It was higher in 1725-1800 than now, and higher 1590-1650 than in 1700, so the 300-400 years are still not enough for all the heat from 1590-1650 and 1725-1800 to have reached us yet. Perhaps you are saying that long-periods of heating have no effect, and short snaps of cooling do all the work? I think I have been saying the opposite. So where is all the heat the sun delivered 1725-1800? Leif: most of it will be heading past stars around 200 light years away about now. And the heat the Sun delivered 1950-2000 would be about 30 light years away on average. Now try to explain that to ‘lgl’. You might succeed where I failed. Most of it is 200 light years away but some is still in the ocean. Fascinating discussion Svalgaard and lgl! Let us assume that the sun is not responsible for the temperature increase the last 300 years and that we further assume that CO2 started to have an impact around1950. Then the billion dollar question is: how do we know that the (unknown) cause of the temperature increase the first 250 years did not continue the last 50 years, and how could we determine the quantitative impact of CO2 (the last 50 years) relative to the (unknown) cause that dominated the first 250 years? That both the Sun and CO2 have an effect, but both being tiny, so not the causes of the observed changes. Or let us assume that the sun is responsible for the temperature increase the last 1400 years. The TSI is as far as I can see from Steinhilber and is not too bad. What is the thin blue line? The thin red one does not show any correlation.